#1 Computer Repair In Baltimore! Submit Form For Your Free Quote! 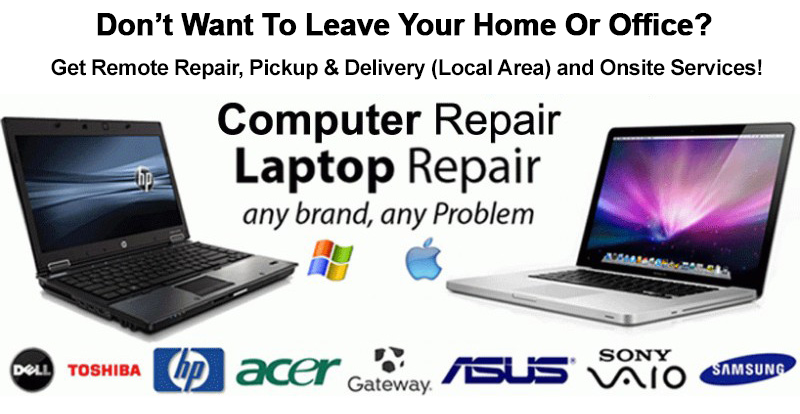 Now You Too Can Get The Best Flat-Rate Computer Repair In Baltimore To Fix Your Broken Desktop Or Laptop! Aren't you sick and tired of throwing away your hard earned money and even your computer every time it gets infected by a virus or gets so slow that you're dozing off waiting for it to boot up or load webpages on the internet? Maybe your business is suffering, you're turning in reports late, can't finish your favorite online movie or even check your emails all because your computer's not acting right . . . or just maybe your laptop or desktop is riddled with annoying popups, slow to connect to the internet, infected with viruses like the dreaded "Ransomware Virus" that takes over your complete system and locks and encrypts all your files until you pay their fee (Tip: never pay anything because your files will never be unlocked this way and they will most likely steal your credit card information and your identity!) or it's sitting there collecting dust just like an expensive paperweight. I'm sure you'll agree that "ENOUGH IS ENOUGH!" Well before you throw away that once perfect machine or waste more time and money letting the so called "Big Box" computer store hold it hostage for weeks all while charging you an arm and a leg for simple repairs and services. . .
For You, I've Got The SOLUTION! Now if you have viruses, tons of malware, popups or software isues, our Hassle-Free Flat Rate Computer Restore Service with Data Backup will "Super Charge" your system, bring it back to life and make it work like new again for much less than the cost of replacing and at a better value than any other repair shop in the area. Yes, you too can have your broken computer or device fixed so that it runs just like you remember - GUARANTEED! And when you bring your computer in for desktop or laptop repair for Data Backup Service, not only will I make sure to back up all of your important photos, videos, documents, music, desktop items and favorites, I'll also remove any viruses that may be hidden in your personal files before they are transferred back to your newly restored system. And if you are having other problems including broken laptop screens, needing to remove viruses from Windows 10, Apple Macbook repairs, Advanced Data Recovery from damaged hard drives, other software fixes or hardware repair needs, I'll take care of those for you too! Your Computer Can Work Like NEW Again! Wont it be great to finally turn on your desktop or laptop and have it boot up quickly to get online at lightning speed so you can use the internet with more peace of mind and less issues? You too deserve to enjoy your computer without worrying about everyday computer mishaps. Well the time is now to take advantage of speedy service that gets the job done! We offer convenient appointments Monday - Saturday between 10:00am and 7:00pm. Call me at 443-876-0027 and book your appointment today. "Our desktop and laptop were hit with a bad virus so we couldn't even get online. A coworker told us about this shop so we decided to give them a try. We were surprised to get both back the same day and they worked great. A++"
And to assure that you are 100% Satisfied with your fixed desktop, laptop or device, we'll also give you a 30 Day Warranty and Free Technical Support on your completed service just in case you have questions or need further help. Join over 1,000 local computer users who we've helped to be "Frustrated No More!" Thank you in advance for choosing us to take care of all your computer repair needs! P.S. Our services are by appointment only so please call to set up a convenient time. P.P.S. Mention coupon code "2019PC" for $10.00 off your first computer repair in Baltimore. About Us: We Provide The Best Computer Repair Baltimore Has To Offer 2009 - 2019 Google Reviews,Yelp Reviews, Angie's List We fix all computer brands and models and specialize in the following: Windows and Apple Service, Laptop & Desktop Computers, Remote Help, Malware & Virus Removal, Data Recovery, Data Transfer, Blue Screen Solutions, Full System Cleaning, Software Install, WIFI and Internet Setup, Laptop LCD / LED Screens, Power Supply Testing, Memory Upgrades and Motherboard Diagnostics.